Over the past 22 years, Taste of the NFL has distributed in excess of $14 million to food banks in every NFL city. This year’s event will be in New York City as part of Super Bowl XLVIII in advance of the big game at MetLife Stadium on February 2! Each year, the organization brings together 35 of the country’s best chefs and pairs them with 35 of the NFL’s greatest past/present players for a memorable evening of food, fun and football on the eve of the Super Bowl. Celeb supporters of Taste of the NFL, include Bobby Flay, Tom Colicchio, Mario Batali, Ted Allen (Chopped), Buddy Valastro (The Cake Boss), and many NFL greats: Ted Hendricks, Kellen Winslow Sr, Anthony Munoz, Randall McDaniel, Joe DeLamielleure, Steve Hauschka, Michael Griffin. Not only does Taste of the NFL host the annual Party with a Purpose – but throughout the year, encourages everyone to participate in the Kick Hunger Challenge – a friendly “competition” pitting fans from all 32 NFL teams against each other to raise money for food banks in NFL communities nationwide. 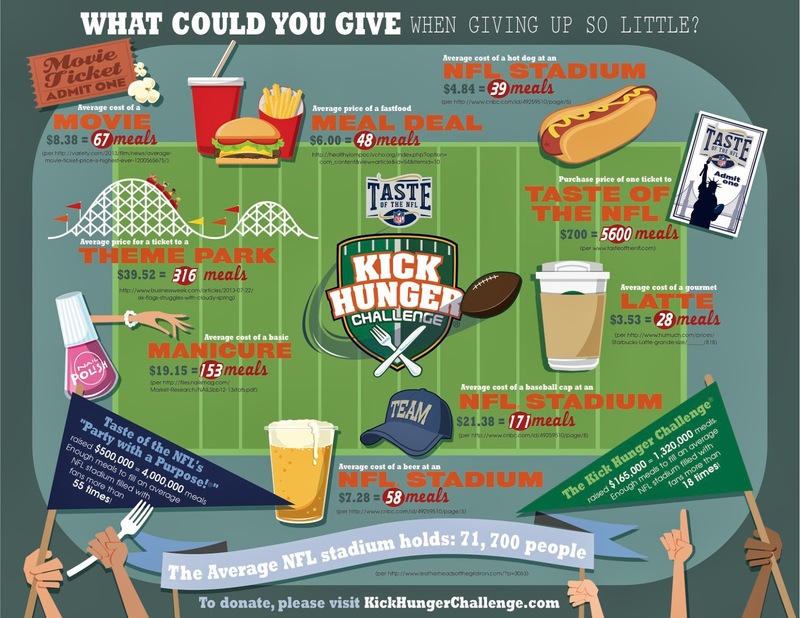 Throughout the 2013-14 football season, fans have the opportunity to support one of the 32 NFL teams or Brooklyn and directly impact the donation of thousands of meals to food banks in their team’s community – a great way to give back this Giving Tuesday!